The idea started during a conversation in the spring of 2004 when ACDA-PA Southwest Region Chair Lisa Jaworowski and Youth & Student Activities Repertoire & Standards Chair Dr. Robin Lind were discussing the needs of the students and directors in the Southwest Pennsylvania region. 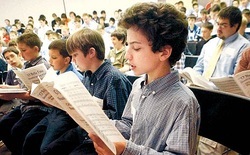 What came of the discussion was that while there are many opportunities for senior high school students to perform at festivals, as well as junior high honor choirs, and elementary song fests, there wasn't anything in our area that specifically addressed the needs of the most daunting of times in a singing boy's life - the voice change. After a little bit of research, it was discovered that other regions in the state were beginning to see this need as well, and had organized some workshops and festivals for young men. Modeling some of what is done each year at the Mansfield University young men's festival led by former ACDA-PA president Dr. Peggy Dettwiler, the beginnings of what is now known as the "Mucho Macho Music" festival took form. Over the past 9 years, the festival has brought together as many as 175 singers in grades 6-9 from all across the Southwest Region to join in a day of music and confidence-building during the most uncertain time of vocal change. Additionally, the festival has provided an opportunity over the years for a partnership with the choral program at Westminster College, New Wilmington, PA. Dr. Robin Lind, director of choral activities, brings her Men's Chorus to the festival during select years as featured guest performers. The Men sing for the participants, but also sit in rehearsal with the boys, encouraging them, and providing a vocal model for what is to come once the voice change takes place. Dr. Lind also uses several of the chorus members in the afternoon at a vocal master class session for the participating directors, so that there is a professional development opportunity for the directors in addition to the enriching activities for their students. North Hills Middle School, 10 minutes north of the city of Pittsburgh, serves as the site host each year. The North Hills School District Food Service department provides a lunch for the day, and the festival ends each year with a short informal closing performance in the auditorium for participating directors and any families who may be picking their students up at 3:00PM.